When Do Fayetteville Drivers Need Transmission Services? Thanks to our complete range of transmission services, Mr. Transmission® Milex® Fayetteville offers everything you need to keep your transmission in top condition. 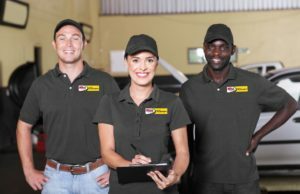 But with all of the different types of transmission services we offer, it can be hard for drivers to know which services they need and when they need them. To help, we’ve put together a short guide to the different types of transmission service we offer and when Fayetteville drivers need these services for their transmission. Transmission Fluid Check. Contaminated, dirty, or low levels of transmission fluid can quickly lead to wear and damage. To prevent damage, transmission fluid should be checked every month. Our transmission service experts offer free fluid checks to Fayetteville-area drivers. Transmission Inspection. Routine transmission inspections can help you spot damage early, giving you the chance to fix damage before it spreads. In addition to our free fluid checks, we offer free transmission inspections. We recommend getting an inspection at least once a year. Transmission Fluid & Filter Change. To keep transmission fluid clean, you should have your transmission’s fluid and filter changed on a regular basis. That could be anywhere from every 15,000 to every 60,000 miles, depending on the make and model of your vehicle. Transmission Reseal. If your transmission is leaking, a transmission reseal may be able to solve the problem. Reseals are less costly than other transmission repairs. But they’re only possible if you catch a leak early, before it leads to internal damage. Transmission Repair. Most transmission components can’t be easily accessed, so minor repairs aren’t always possible. But if a worn or damaged part can be replaced without removing and rebuilding your transmission, this will be a much more budget-friendly option. Transmission Rebuild. Any time there’s internal damage to your transmission, you’ll need a transmission rebuild or a replacement: the only two ways you can correct internal damage. A rebuild means uninstalling and disassembling your transmission, testing all parts, replacing faulty components, reassembling your transmission, and reinstalling the complete system. Transmission Replacement. Transmission rebuilds are labor-intensive, so if the damage to your transmission is widespread, it is sometimes less expensive to replace your transmission completely. The transmission service team at Mr. Transmission Milex Fayetteville can help you determine which is the more budget-friendly option. Looking for a transmission service center in Fayetteville, GA? You’ll find everything your transmission needs with the transmission service specialists at Mr. Transmission Milex Fayetteville. Contact us today to book a fluid check, transmission inspection, or another transmission service for your vehicle. Book transmission services for your vehicle with Mr. Transmission Milex Fayetteville by calling today.